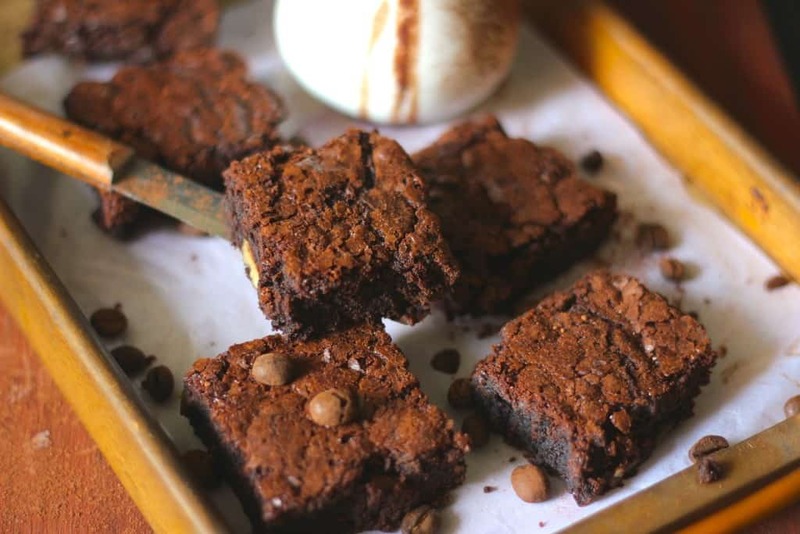 Chocolate Brownies are a thing of beauty. They are without a doubt the dessert that disappears most quickly at home. It’s only on rare occasions that a pan of chocolate brownies lasts more than 24 hours around here. We are completely content eating them straight from the pan. And a warm brownie with a cool scoop of vanilla ice cream and hot chocolate sauce? That’s damn near perfection the way I see it. Many people ask me is there any difference between the brownie and a chocolate cake, yes there’s a huge difference. A Chocolate Brownie is a flat, baked square or bar developed in the United States at the end of the 19th century. It was popularized in both the U.S. and Canada during the first half of the 20th century. 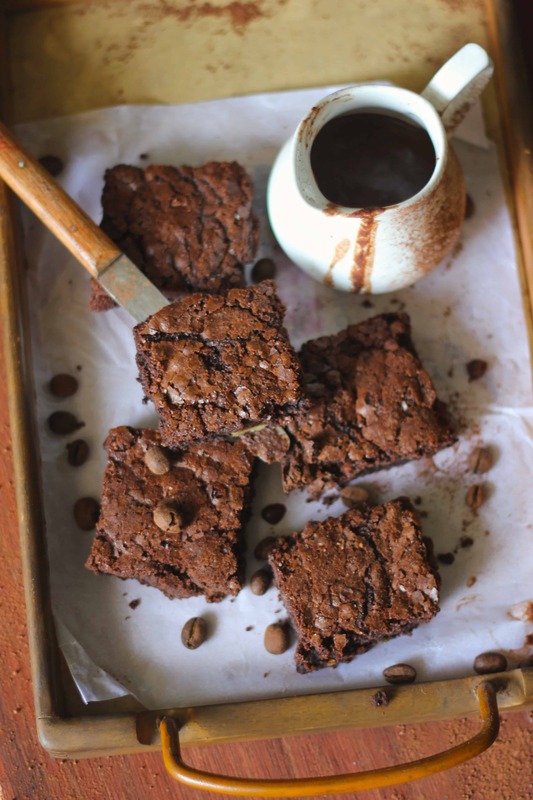 After trying hands on many chocolate brownies recipes, we finally zeroed down to this one. This one always yields results near to perfection. 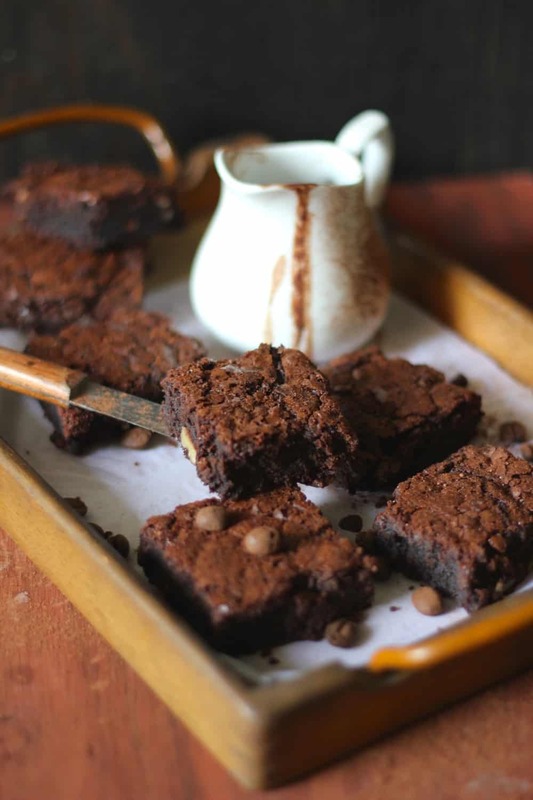 The fudgy, gooey, dark brownie is what we crave for and these chocolate brownies satiate those hankerings. 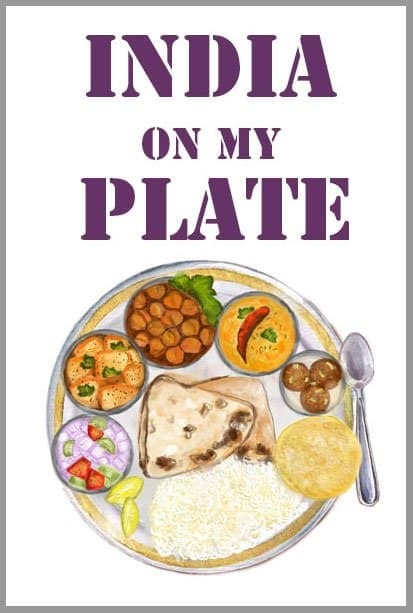 To get the recipe right, we recommend measure out all the ingredients using a weighing machine. This way the proportion of butter and chocolate is absolutely accurate and even. Over-baking brownies is a sin if you love really fudgy and moist brownies than don’t let them sit in the oven for too long. So let’s not waste time and find out…. 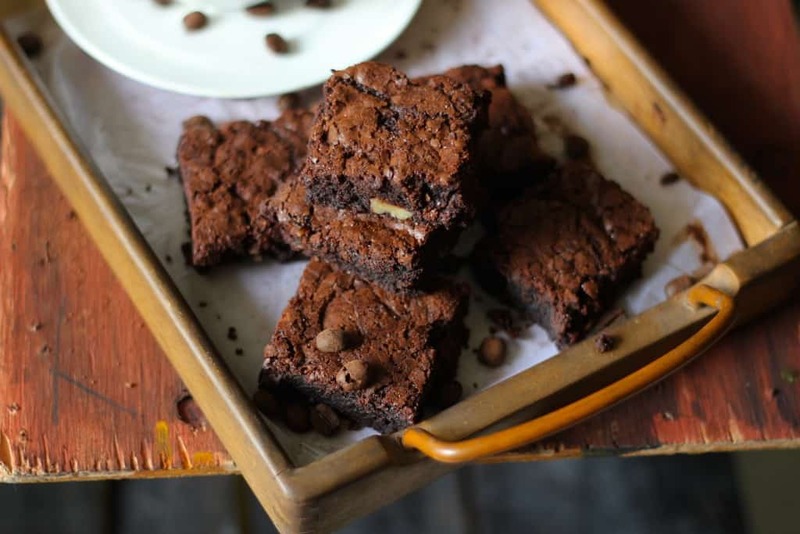 How to Make Perfect Chocolate Brownies? 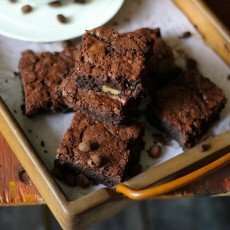 Crazy about Chocolate Brownies? 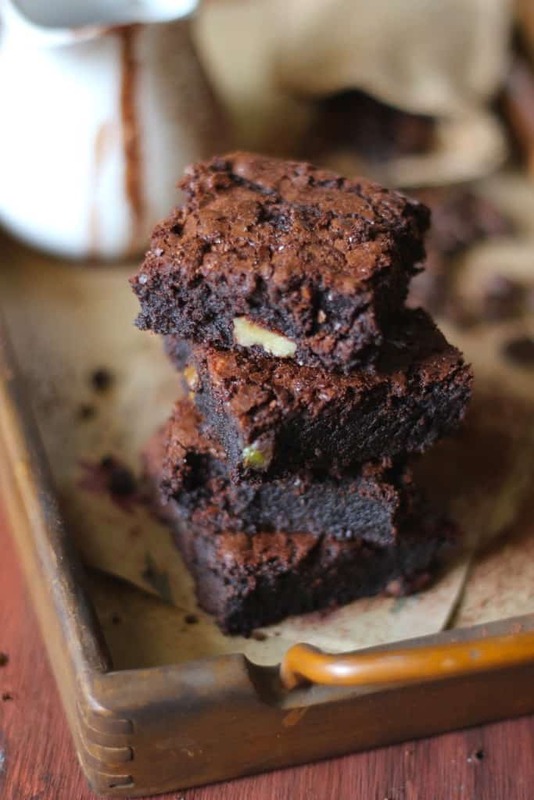 Then you might like these brownie recipes as well – Fudgy Cocoa Brownie, Eggless Brownie, and Low Fat Plum Brownie. Chocolate brownies are easy dessert recipes. Check out full recipe of warm brownie with a cool scoop of vanilla ice cream and hot chocolate sauce. To make chocolate brownie, preheat oven at 170° C. Line 9 inch square tin with parchment paper and grease it with little butter. Sift flour, cocoa powder, salt together in a bowl. Keep aside until required. In a large ceramic bowl add chopped chocolate and butter. In a little smaller heat resistant bowl add 1 Cup water. Arrange bowl of chocolate over water bowl. Heat over medium flame stir chocolate and butter with spatula to avoid sticking to the bowl. Keep on stirring until chocolate and butter is melted. Keep the melted liquid aside while you beat eggs. In a bowl add eggs with vanilla, chocolate essence and sugar. Beat with Hand Mixer starting with speed level 2 gradually moving to higher speed. Beat until mixture turns light and creamy. Add the cooled down melted chocolate to the eggs. Beat once again for 2 – 3 minutes using hand mixer at medium speed. Once melted chocolate and egg mixture evenly combined fold in the sifted flour into the liquids. Combine nicely using the spatula so that no lumps remain in the batter. Add chopped walnuts and mix batter once again. Pour the brownie batter into the prepared tin. Bake for 35 minutes insert toothpick and test for doneness. Bring tin out of the oven. Let brownie sit in the tin for 10 minutes. Then transfer to a wire rack and let it cool down for sometimes. Once brownie cooled down cut into squares. Serve Chocolate Brownie with vanilla ice cream and chocolate sauce. any options to replace eggs with ? Hi Hina! This one is again super tempting. I am still finding options on the dessert like these, without the use of baking… cuz of obvious reasons. Please let me know if there’s any method on achieving perfection for cake and brownie without baking.